If you’re looking for self-storage in Florida, there are several things to know that can make your experience convenient and secure. Self-storage in Florida is unique from storage in other states, partly because of climate issues that make it harder to store items without damage in the humid, hot air. The lack of adequate household storage in Florida is partially due to building trends that favor style and outdoor living space over storage space. After all, if you have a waterfront condo in Pompano Beach, do you want an extra closet or a porch with a sweeping view of the ocean? There are many self-storage facilities to choose from in this area, but they aren’t all equal. Here are six things to look for in a South Florida storage unit. Drive up access to your storage unit, preferably covered. 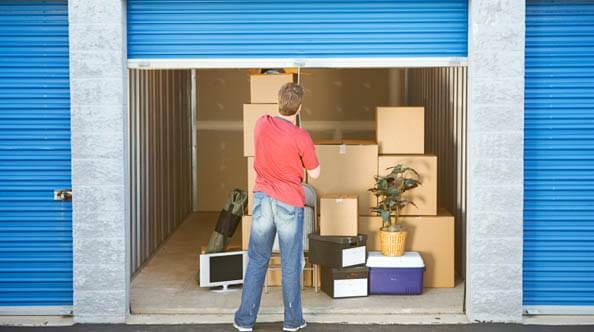 Loading and unloading an entire moving truck into your storage unit is hard enough without having to walk an extra 1000 feet with each load, or worry about rain damaging your belongings and furniture. Finding a storage unit with a covered loading bay area will really help ease the stress when you’re moving things in and out, and when you stop by to pick up items you need. Clean and well lit facilities. This is a must. The most secure and safe storage units are indoor units and are more like apartments, rather than a bay of garages in a poorly lit parking lot. Vermin can be a problem in outdoor storage units in South Florida. Storage protection plan. Look for a self-storage company that offers a storage protection plan of some sort. For a small additional fee, you can add a protection plan at some places that will reimburse you for any damage to your property while it’s in storage. Even if you don’t end up getting it the additional protection of this plan, you can be confident that a company that offers a protection plan like this will be more serious about not letting any customer’s goods be damaged. Business center onsite. If you’re in the middle of a move, having free Internet service and a place to read your emails in peace is a great benefit. Customers who put household belongings in storage before taking a long sailing trip also appreciate this benefit. If you’re in any of these situations, an onsite business center might be something to look for. State of the art security. Look for a self-storage company that has individual door alarms on each storage unit and 24-hour security cameras. Check access times as well. Companies offering 24-hour access may not be as safe as companies that have standard business hours, which are usually around 6:00 am to 9:00 pm in this area. Climate controlled environment. Florida’s subtropical climate, heat, rain, and humidity can be hard on items you have in your home, office, or in your storage unit. Storing items in garages or garage-type outdoor storage units can be dangerous in hurricane season, attract vermin, and will increase your risk of having moisture and humidity damage to your belongings. Opting for an indoor storage unit that’s climate controlled is the best bet for the safety and protection of your belongings. Value Store It is South Florida’s premiere self-storage facility. With locations in Miami, North Miami Beach, Virginia Gardens, Doral, Miami Lakes, Pompano Beach, North Lauderdale, and Fort Lauderdale, Florida, we offer covered loading bays, free moving truck rental, and a clean, well-lit environment.